We are all hit with bouts of insomnia from time to time – but for some of us, anxiety induced insomnia can be a stressful and traumatic experience. Some of you may simply find it difficult to get to sleep and have a full night’s rest. Others find that their insomnia is part of an anxious cycle that wreaks havoc with their day-to-day routine. 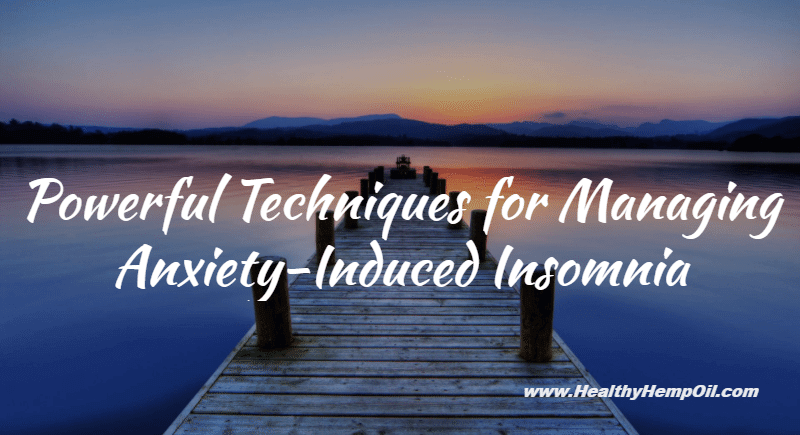 Fortunately, there is a range of methods and practices that can be put to use to manage anxiety-induced insomnia and help you regain control of your sleep cycle. Insomnia is an incredibly common problem; some studies have shown it to regularly affect one in every three people. Most people who experience insomnia find it difficult to fall asleep and wake up several times during the night. If you have insomnia, you may find that you lie awake in bed, waiting to fall asleep and getting lost in thought, or you may find that, when you wake up, you are not refreshed or rejuvenated. A lot of the time, this sleep deprivation has further effects throughout your day, such as irritable moods and a constant feeling of tiredness and exhaustion. Anxiety and insomnia go hand in hand to create a difficult, disruptive cycle. Anxiety can cause insomnia, and chronic insomnia can cause anxiety. Each of these conditions increases the symptoms of the other, which is why managing both together is a vital step towards returning to restful, anxiety-free nights. A common sign of anxiety-induced insomnia is a tendency to become “lost in worry” when attempting to sleep. You may find it hard to quiet your thoughts and reach a restful mental state. This can be chronic (where sleepless nights occur for the majority of a month or even more often), or it can be the result of distressing life events – such as struggles at work or in your family life or stress due to injury, illness or trauma. While there are pharmaceutical interventions to help curb anxiety-induced insomnia, there is also a range of powerful, effective methods to help manage and minimise this condition. Below are six techniques that you can put to immediate use to help manage your insomnia. Mindfulness is essentially a simple form of meditation, and it has proven to be particularly effective in managing anxiety-based disorders. Simply put, mindfulness is about paying attention to the present moment and accepting your thoughts, feelings and sensations for what they are. To be most effective, mindfulness should be practised regularly and become a part of your routine. The overall aim is for this type of meditation to become part of your tool kit for dealing with anxious thoughts when they occur. It allows you to be objective regarding how your mind works. Once you come to terms with how your mind reacts and begin to listen to the thoughts that occur to you without judgment or negative reactions, you will find yourself in more control of your behavioral responses and able to come to terms with the way your mind works. It’s important to take stock of lifestyle choices and assess whether you’re making healthy choices on a daily basis. Exercising is an easy, natural way to burn off excess energy and essentially help to tire you out. The more tired you are, the more your body craves sleep to rest, repair and grow. At the same time, it’s important to make sure that you don’t exercise too late in the day. Stimulating activity before bedtime can put your mind into a more active gear and could exacerbate your problems getting to sleep. Instead, try to exercise for at least 30 minutes per day, preferably before dinner. It doesn’t have to be high-impact cardiovascular exercise; as long as you’re active and moving every day, you’ll be helping to reduce your insomnia. Setting up a regular bedtime routine gives your brain permission to relax. When we’re doing activities that we are used to, we often say that we’re doing them on “auto-pilot.” Getting into this state is an effective way to wind down before you sleep. If you can, try to ensure that your set bedtime is the same every night, and create a routine around what you do just before bed. Focus on the small tasks that you carry out – changing into your night clothes, brushing your teeth, reading a book for a set period or listening to calm, relaxing music. Try to maintain this routine, and you’ll find that your mind will learn the signals and cues for when it is time to power down. While some may find a night-cap before bed effective, it can cause those with insomnia to stay up even later than usual. If you’re already anxious and stressed, adding a depressant such as alcohol, or even a stimulant such as caffeine, can have adverse effects on your internal body clock. Try cutting coffee and alcohol out of your routine, as these two particular drugs will interfere with your ability to quiet the worries that are keeping you up. When you’re trying to get to sleep, it’s very important to shut down screens for at least an hour before you get into bed. This includes television, laptop screens and even cellphones. The vivid, internal light from your screens send signals to your brain that trick it into believing that it’s daytime. Ensuring that there is a transition period without screens can have an immediate positive impact on insomnia that many people find surprising. Tear yourself away from your screens before bed, and you’ll reap the dreamy rewards before you know it. Another part of your transition to bedtime should include creating a calming environment. Only use your bedroom for sleep, and make sure that it is tidy, quiet, cool and dark. Try to make your bedroom more sleep-friendly. If it helps, listen to calming music, and take a warm bath before sleeping. These elements together create a calming environment that can help signal your brain to begin the process of falling asleep and processing the day’s inputs. While there is no doubt that anxiety-induced insomnia can be stressful and disruptive, it’s important to know that you do have control and can take active steps to manage your anxiety. By creating a regular bedtime routine, ensuring you have a calm sleeping environment, cutting out coffee and alcohol, shutting down bright light sources, and practicing mindfulness, you can empower yourself to deal with your restless nights. Do you have anxiety-induced insomnia? Have you tried any of these techniques to help manage your anxiety and get a restful night’s sleep? Let us know below if they have helped you or if you have any other techniques to share.